The term adaptive technology is often used as the synonym for assistive technology; however, they are different terms. Assistive technology refers to "any item, piece of equipment, or product system, whether acquired commercially, modified, or customized, that is used to increase, maintain, or improve functional capabilities of individuals with disabilities", while adaptive technology covers items that are specifically designed for persons with disabilities and would seldom be used by non-disabled persons. In other words, "assistive technology is any object or system that increases or maintains the capabilities of people with disabilities," while adaptive technology is "any object or system that is specifically designed for the purpose of increasing or maintaining the capabilities of people with disabilities." Consequently, adaptive technology is a subset of assistive technology. Adaptive technology often refers specifically to electronic and information technology access. Wheelchairs are devices that can be manually propelled or electrically propelled, and that include a seating system and are designed to be a substitute for the normal mobility that most people have. Wheelchairs and other mobility devices allow people to perform mobility-related activities of daily living which include feeding, toileting, dressing, grooming, and bathing. The devices come in a number of variations where they can be propelled either by hand or by motors where the occupant uses electrical controls to manage motors and seating control actuators through a joystick, sip-and-puff control, or other input devices. Often there are handles behind the seat for someone else to do the pushing or input devices for caregivers. Wheelchairs are used by people for whom walking is difficult or impossible due to illness, injury, or disability. People with both sitting and walking disability often need to use a wheelchair or walker. Patient transfer devices generally allow patients with impaired mobility to be moved by caregivers between beds, wheelchairs, commodes, toilets, chairs, stretchers, shower benches, automobiles, swimming pools, and other patient support systems (i.e., radiology, surgical, or examining tables). The most common devices are Patient lifts (for vertical transfer), Transfer benches, stretcher or convertible chairs (for lateral, supine transfer), sit-to-stand lifts (for moving patients from one seated position to another i.e., from wheelchairs to commodes), air bearing inflatable mattresses (for supine transfer i.e., transfer from a gurney to an operating room table), and sliding boards (usually used for transfer from a bed to a wheelchair). Highly dependent patients who cannot assist their caregiver in moving them often require a Patient lift (a floor or ceiling-suspended sling lift) which though invented in 1955 and in common use since the early 1960s is still considered the state-of-the-art transfer device by OSHA and the American Nursing Association. A walker or walking frame or Rollator is a tool for disabled people who need additional support to maintain balance or stability while walking. It consists of a frame that is about waist high, approximately twelve inches deep and slightly wider than the user. Walkers are also available in other sizes, such as for children, or for heavy people. Modern walkers are height-adjustable. The front two legs of the walker may or may not have wheels attached depending on the strength and abilities of the person using it. It is also common to see caster wheels or glides on the back legs of a walker with wheels on the front. A prosthesis, prosthetic, or prosthetic limb is a device that replaces a missing body part. It is part of the field of biomechatronics, the science of using mechanical devices with human muscle, skeleton, and nervous systems to assist or enhance motor control lost by trauma, disease, or defect. Prostheses are typically used to replace parts lost by injury (traumatic) or missing from birth (congenital) or to supplement defective body parts. Inside the body, artificial heart valves are in common use with artificial hearts and lungs seeing less common use but under active technology development. Other medical devices and aids that can be considered prosthetics include hearing aids, artificial eyes, palatal obturator, gastric bands, and dentures. Prostheses are specifically not orthoses, although given certain circumstances a prosthesis might end up performing some or all of the same functionary benefits as an orthosis. Prostheses are technically the complete finished item. For instance, a C-Leg knee alone is not a prosthesis, but only a prosthetic component. The complete prosthesis would consist of the attachment system to the residual limb — usually a "socket", and all the attachment hardware components all the way down to and including the terminal device. Keep this in mind as nomenclature is often interchanged. The terms "prosthetic" and "orthotic" are adjectives used to describe devices such as a prosthetic knee. The terms "prosthetics" and "orthotics" are used to describe the respective allied health fields. One example of screen readers is Apple VoiceOver. This software is provided free of charge on all Apple devices. Apple VoiceOver includes the option to magnify the screen, control the keyboard, and provide verbal descriptions to describe what is happening on the screen. There are thirty languages to select from. It also has the capacity to read aloud file content, as well as web pages, E-mail messages, and word processing files. 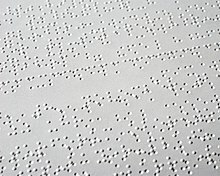 Braille is a system of raised dots representing letters, numbers, punctuation, and words. Braille is a system of raised dots formed into units called braille cells. A full braille cell is made up of six dots, with two parallel rows of three dots, but other combinations and quantities of dots represent other letters, numbers, punctuation marks, or words. People can then use their fingers to read the code of raised dots. A refreshable braille display or braille terminal is an electro-mechanical device for displaying braille characters, usually by means of round-tipped pins raised through holes in a flat surface. Computer users who cannot use a computer monitor use it to read a braille output version of the displayed text. Desktop video magnifiers are electronic devices that use a camera and a display screen to perform digital magnification of printed materials. They enlarge printed pages for those with low vision. A camera connects to a monitor that displays real-time images, and the user can control settings such as magnification, focus, contrast, underlining, highlighting, and other screen preferences. They come in a variety of sizes and styles; some are small and portable with handheld cameras, while others are much larger and mounted on a fixed stand. A screen magnifier is software that interfaces with a computer's graphical output to present enlarged screen content. It allows users to enlarge the texts and graphics on their computer screens for easier viewing. Similar to desktop video magnifiers, this technology assists people with low vision. After the user loads the software into their computer's memory, it serves as a kind of "computer magnifying glass." Wherever the computer cursor moves, it enlarges the area around it. This allows greater computer accessibility for a wide range of visual abilities. A large-print keyboard has large letters printed on the keys. On the keyboard shown, the round buttons at the top control software which can magnify the screen (zoom in), change the background color of the screen, or make the mouse cursor on the screen larger. The "bump dots" on the keys, installed in this case by the organization using the keyboards, help the user find the right keys in a tactile way. Assistive technology for navigation has exploded on the IEEE Xplore database since 2000, with over 7,500 engineering articles written on assistive technologies and visual impairment in the past 25 years, and over 1,300 articles on solving the problem of navigation for people who are blind or visually impaired. As well, over 600 articles on augmented reality and visual impairment have appeared in the engineering literature since 2000. Most of these articles were published within the past 5 years, and the number of articles in this area is increasing every year. GPS, accelerometers, gyroscopes, and cameras can pinpoint the exact location of the user and provide information on what's in the immediate vicinity, and assistance in getting to a destination. Wearable technology are smart electronic devices that can be worn on the body as an implant or an accessory. New technologies are exploring how the visually impaired can receive visual information through wearable devices. In human–computer interaction, computer accessibility (also known as accessible computing) refers to the accessibility of a computer system to all people, regardless of disability or severity of impairment, examples include web accessibility guidelines. Another approach is for the user to present a token to the computer terminal, such as a smart card, that has configuration information to adjust the computer speed, text size, etc. to their particular needs. This is useful where users want to access public computer based terminals in Libraries, ATM, Information kiosks etc. The concept is encompassed by the CEN EN 1332-4 Identification Card Systems - Man-Machine Interface. This development of this standard has been supported in Europe by SNAPI and has been successfully incorporated into the Lasseo specifications, but with limited success due to the lack of interest from public computer terminal suppliers. People in the d/Deaf and hard of hearing community have a more difficult time receiving auditory information as compared to hearing individuals. These individuals often rely on visual and tactile mediums for receiving and communicating information. The use of assistive technology and devices provides this community with various solutions to auditory communication needs by providing higher sound (for those who are hard of hearing), tactile feedback, visual cues and improved technology access. Individuals who are deaf or hard of hearing utilize a variety of assistive technologies that provide them with different access to information in numerous environments. Most devices either provide amplified sound or alternate ways to access information through vision and/or vibration. These technologies can be grouped into three general categories: Hearing Technology, alerting devices, and communication support. A hearing aid or deaf aid is an electroacoustic device which is designed to amplify sound for the wearer, usually with the aim of making speech more intelligible, and to correct impaired hearing as measured by audiometry. This type of assistive technology helps people with hearing loss participate more fully in their hearing communities by allowing them to hear more clearly. They amplify any and all sound waves through use of a microphone, amplifier, and speaker. There is a wide variety of hearing aids available, including digital, in-the-ear, in-the-canal, behind-the-ear, and on-the-body aids. Assistive listening devices include FM, infrared, and loop assistive listening devices. This type of technology allows people with hearing difficulties to focus on a speaker or subject by getting rid of extra background noises and distractions, making places like auditoriums, classrooms, and meetings much easier to participate in. The assistive listening device usually uses a microphone to capture an audio source near to its origin and broadcast it wirelessly over an FM (Frequency Modulation) transmission, IR (Infra Red) transmission, IL (Induction Loop) transmission, or other transmission methods. The person who is listening may use an FM/IR/IL Receiver to tune into the signal and listen at his/her preferred volume. This type of assistive technology allows users to amplify the volume and clarity of their phone calls so that they can easily partake in this medium of communication. There are also options to adjust the frequency and tone of a call to suit their individual hearing needs. Additionally, there is a wide variety of amplified telephones to choose from, with different degrees of amplification. For example, a phone with 26 to 40 decibel is generally sufficient for mild hearing loss, while a phone with 71 to 90 decibel is better for more severe hearing loss. Augmentative and alternative communication (AAC) is an umbrella term that encompasses methods of communication for those with impairments or restrictions on the production or comprehension of spoken or written language. AAC systems are extremely diverse and depend on the capabilities of the user. They may be as basic as pictures on a board that are used to request food, drink, or other care; or they can be advanced speech generating devices, based on speech synthesis, that are capable of storing hundreds of phrases and words. Assistive Technology for Cognition (ATC) is the use of technology (usually high tech) to augment and assist cognitive processes such as attention, memory, self-regulation, navigation, emotion recognition and management, planning, and sequencing activity. Systematic reviews of the field have found that the number of ATC are growing rapidly, but have focused on memory and planning, that there is emerging evidence for efficacy, that a lot of scope exists to develop new ATC. Examples of ATC include: NeuroPage which prompts users about meetings, Wakamaru, which provides companionship and reminds users to take medicine and calls for help if something is wrong, and telephone Reassurance systems. Memory aids are any type of assistive technology that helps a user learn and remember certain information. Many memory aids are used for cognitive impairments such as reading, writing, or organizational difficulties. For example, a Smartpen records handwritten notes by creating both a digital copy and an audio recording of the text. Users simply tap certain parts of their notes, the pen saves it, and reads it back to them. From there, the user can also download their notes onto a computer for increased accessibility. Digital voice recorders are also used to record "in the moment" information for fast and easy recall at a later time. Educational software is software that assists people with reading, learning, comprehension, and organizational difficulties. Any accommodation software such as text readers, notetakers, text enlargers, organization tools, word predictions, and talking word processors falls under the category of educational software. Adaptive eating devices include items commonly used by the general population like spoons and forks and plates. However they become assistive technology when they are modified to accommodate the needs of people who have difficultly using standard cutlery due to a disabling condition. Common modifications include increasing the size of the utensil handle to make it easier to grasp. Plates and bowls may have a guard on the edge that stops food being pushed off of the dish when it is being scooped. More sophisticated equipment for eating includes manual and powered feeding devices. These devices support those who have little or no hand and arm function and enable them to eat independently. Assistive technology in sports is an area of technology design that is growing. Assistive technology is the array of new devices created to enable sports enthusiasts who have disabilities to play. Assistive technology may be used in adaptive sports, where an existing sport is modified to enable players with a disability to participate; or, assistive technology may be used to invent completely new sports with athletes with disabilities exclusively in mind. An increasing number of people with disabilities are participating in sports, leading to the development of new assistive technology. Assistive technology devices can be simple, or "low-tech", or they may use highly advanced technology. "Low-tech" devices can include velcro gloves and adaptive bands and tubes. "High-tech" devices can include all-terrain wheelchairs and adaptive bicycles. Accordingly, assistive technology can be found in sports ranging from local community recreation to the elite Paralympic Games. More complex assistive technology devices have been developed over time, and as a result, sports for people with disabilities "have changed from being a clinical therapeutic tool to an increasingly competition-oriented activity". In the United States there are two major pieces of legislation that govern the use of assistive technology within the school system. The first is Section 504 of the Rehabilitation Act of 1973 and the second being the Individuals with Disabilities Education Act (IDEA) which was first enacted in 1975 under the name The Education for All Handicapped Children Act. In 2004, during the reauthorization period for IDEA, the National Instructional Material Access Center (NIMAC) was created which provided a repository of accessible text including publisher's textbooks to students with a qualifying disability. Files provided are in XML format and used as a starting platform for braille readers, screen readers, and other digital text software. IDEA defines assistive technology as follows: "any item, piece of equipment, or product system, whether acquired commercially off the shelf, modified, or customized, that is used to increase, maintain, or improve functional capabilities of a child with a disability. (B) Exception.--The term does not include a medical device that is surgically implanted, or the replacement of such device." Assistive technology in this area is broken down into low, mid, and high tech categories. Low tech encompasses equipment that is often low cost and does not include batteries or requires charging. Examples include adapted paper and pencil grips for writing or masks and color overlays for reading. Mid tech supports used in the school setting include the use of handheld spelling dictionaries and portable word processors used to keyboard writing. High tech supports involve the use of tablet devices and computers with accompanying software. Software supports for writing include the use of auditory feedback while keyboarding, word prediction for spelling, and speech to text. Supports for reading include the use of text to speech (TTS) software and font modification via access to digital text. Limited supports are available for math instruction and mostly consist of grid based software to allow younger students to keyboard equations and auditory feedback of more complex equations using MathML and Daisy. One of the largest problems that affect people with disabilities is discomfort with prostheses. An experiment performed in Massachusetts utilized 20 people with various sensors attached to their arms. The subjects tried different arm exercises, and the sensors recorded their movements. All of the data helped engineers develop new engineering concepts for prosthetics. Assistive technology may attempt to improve the ergonomics of the devices themselves such as Dvorak and other alternative keyboard layouts, which offer more ergonomic layouts of the keys. Assistive technology devices have been created to enable people with disabilities to use modern touch screen mobile computers such as the iPad, iPhone and iPod touch. The Pererro is a plug and play adapter for iOS devices which uses the built in Apple VoiceOver feature in combination with a basic switch. This brings touch screen technology to those who were previously unable to use it. Apple, with the release of iOS 7 had introduced the ability to navigate apps using switch control. Switch access could be activated either through an external bluetooth connected switch, single touch of the screen, or use of right and left head turns using the device's camera. Additional accessibility features include the use of Assistive Touch which allows a user to access multi-touch gestures through pre-programmed onscreen buttons. For users with physical disabilities a large variety of switches are available and customizable to the user's needs varying in size, shape, or amount of pressure required for activation. Switch access may be placed near any area of the body which has consistent and reliable mobility and less subject to fatigue. Common sites include the hands, head, and feet. Eye gaze and head mouse systems can also be used as an alternative mouse navigation. A user may utilize single or multiple switch sites and the process often involves a scanning through items on a screen and activating the switch once the desired object is highlighted. The form of home automation called assistive domotics focuses on making it possible for elderly and disabled people to live independently. Home automation is becoming a viable option for the elderly and disabled who would prefer to stay in their own homes rather than move to a healthcare facility. This field uses much of the same technology and equipment as home automation for security, entertainment, and energy conservation but tailors it towards elderly and disabled users. For example, automated prompts and reminders utilize motion sensors and pre-recorded audio messages; an automated prompt in the kitchen may remind the resident to turn off the oven, and one by the front door may remind the resident to lock the door. Overall, assistive technology aims to allow people with disabilities to "participate more fully in all aspects of life (home, school, and community)" and increases their opportunities for "education, social interactions, and potential for meaningful employment". It creates greater independence and control for disabled individuals. For example, in one study of 1,342 infants, toddlers and preschoolers, all with some kind of developmental, physical, sensory, or cognitive disability, the use of assistive technology created improvements in child development. These included improvements in "cognitive, social, communication, literacy, motor, adaptive, and increases in engagement in learning activities". Additionally, it has been found to lighten caregiver load. Both family and professional caregivers benefit from assistive technology. Through its use, the time that a family member or friend would need to care for a patient significantly decreases. However, studies show that care time for a professional caregiver increases when assistive technology is used. Nonetheless, their work load is significantly easier as the assistive technology frees them of having to perform certain tasks. There are several platforms that use machine learning to identify the appropriate assistive device to suggest to patients, making assistive devices more accessible. Wikimedia Commons has media related to Assistive technology. American Speech-Language-Hearing Association. (2005). "Roles and Responsibilities of Speech-Language Pathologists With Respect to Augmentative and Alternative Communication: Position Statement". Archived from the original on February 13, 2009. Retrieved January 23, 2009. DeCoste, Denise C. (1997). "Chapter 10: Introduction to Augmentative and Alternative Communication Systems". In Glennen, Sharon; DeCoste, Denise C. (eds.). Handbook Of Augmentative And Alternative Communication. San Diego, CA: Singular Publishing Group. ISBN 978-1-56593-684-3. Schlosser, R. W.; Wendt, O. (2008). "Effects of augmentative and alternative communication intervention on speech production in children with autism: a systematic review". American Journal of Speech-Language Pathology. 17 (3): 212–230. doi:10.1044/1058-0360(2008/021). PMID 18663107. Beukelman, David R.; Mirenda, Pat (2005). Augmentative & alternative communication: supporting children & adults with complex communication needs (3rd ed.). Paul H. Brookes Publishing Company. ISBN 978-1-55766-684-0. Galvão Filho, T. (2009). "Tecnologia Assistiva para uma Escola Inclusiva: apropriação, demandas e perspectivas. Tese (Doutorado em Educação) – Faculdade de Educação, Universidade Federal da Bahia, Salvador, Brazil". Mirenda, P. (2003). "Toward Functional Augmentative and Alternative Communication for Students With Autism: Manual Signs, Graphic Symbols, and Voice Output Communication Aids". Language, Speech, & Hearing Services in Schools. 34 (3): 203–216. doi:10.1044/0161-1461(2003/017). PMID 27764322. Mathy; Yorkston, K.; Guttman (2000). "Augmentative Communication for Individuals with Amyotrophic Lateral Sclerosis". In Beukelman, D.; Yorkston, K.; Reichle, J. (eds.). Augmentative and Alternative Communication Disorders for Adults with Acquired Neurologic Disorders. Baltimore: P. H. Brookes Pub. ISBN 978-1-55766-473-0. Jans, Deborah; Clark, Sue (1998). "Chapter 6: High Technology Aids to Communication". In Wilson, Allan (ed.). Augmentative Communication in Practice: An Introduction. University of Edinburgh. ISBN 978-1-898042-15-0. Parette, H. P.; Brotherson, M. J; Huer, M. B. (2000). "Giving families a voice in augmentative and alternative communication decision-making". Education and Training in Mental Retardation and Developmental Disabilities. 35: 177–190. ^ Parant, Aymeric; Schiano-Lomoriello, Sandrine; Marchan, Francis (October 2017). "How would I live with a disability? Expectations of bio-psychosocial consequences and assistive technology use". Disability and Rehabilitation. Assistive Technology. 12 (7): 681–685. doi:10.1080/17483107.2016.1218555. ISSN 1748-3115. PMID 27677931. ^ "Assistive Technology Act of 1998 | Section508.gov". section508.gov. Retrieved April 4, 2016. ^ "Tennessee Science Standards" (PDF). Retrieved October 5, 2012. ^ "Assessing for Adaptive Technology Needs". Retrieved October 5, 2012. ^ Pardes, Arielle. "The Wearables Giving Computer Vision to the Blind". Wired. Wired. Retrieved September 5, 2017. ^ "Home". Mental Health Foundation. ^ "CEN EN 1332-4 Identification Card Systems - Man-Machine Interface". ^ "Assistive Technology for Individuals who are Deaf or Hard of Hearing" (PDF). Retrieved November 8, 2015. ^ "Guide to Amplified Phones". assistech.com. Retrieved November 25, 2015. ^ Gilliam & Marquardt, pp. 356–359. ^ LoPresti, E.F., Mihailidis, A. & Kirsch, N. (2004). Assistive Technology for cognitive rehabilitation: State of the art. Neuropsychological Rehabilitation, 14, 5-39. ^ Gillespie, A., Best, C. & O'Neill, B. (2012). Cognitive function and Assistive Technology for cognition: A systematic review. Journal of the International Neuropsychological Society, 18, 1-19. ^ Wilson, et al. (1997). Evaluation of NeuroPage: A new memory aid. Journal of Neurology, Neurosurgery, and Psychiatry, 63, 113-115. ^ "Using External Aids to Compensate for Memory and Organizational Problems Post-TBI". Retrieved November 30, 2015. ^ Scherer, Marcia; Stefano Federici (2012). Assistive Technology Assessment Handbook. CRC Press. p. 425. ISBN 9781439838655. ^ Scherer, Marcia; Stefano Federici (2012). Assistive Technology Assessment Handbook. CRC Press. p. 427. ISBN 9781439838655. ^ "National Instructional Materials Access Center". ^ "Building the Legacy: IDEA 2004". ^ a b c Abdullah, Hussein A.; Tarry, Cole; Datta, Rahul. ; Mittal, Gauri S.; Abderrahim, Mohamed (2007). "Dynamic Biomechanical Model for Assessing and Monitoring Robot-Assisted Upper-Limb Therapy". Journal of Rehabilitation Research and Development. 44 (1): 43–62. doi:10.1682/JRRD.2006.03.0025. PMID 17551857. ^ Chubon, R.A.; Hester, M.R. (1988). "An enhanced standard computer keyboard system for single-finger and typing-stick typing". Journal of Rehabilitation Research and Development. 25 (4): 17–24. PMID 2973523. ^ Anson, D.; George, S.; Galup, R.; Shea, B.; Vetter, R. (2001). "Efficiency of the Chubon versus the QWERTY keyboard". Assistive Technology. 13 (1): 40–5. doi:10.1080/10400435.2001.10132032. PMID 12212435. ^ Judd, Natasha. "Assistive technology - devices to help with everyday living". www.alzheimers.org.uk. Retrieved November 30, 2015. ^ "Considering Assistive Technology | Center for Parent Information and Resources". www.parentcenterhub.org. Retrieved November 25, 2015. ^ Desch, Larry W.; Gaebler-Spira, Deborah (June 1, 2008). "Prescribing Assistive-Technology Systems: Focus on Children With Impaired Communication". Pediatrics. 121 (6): 1271–1280. doi:10.1542/peds.2008-0695. ISSN 0031-4005. PMID 18519500. ^ Dunst, Trivette; Hamby, Simkus (August 2013). "Research Summary on Assistive Technology Interventions" (PDF). Community. Retrieved November 24, 2015. ^ Nicolson, Amy; Moir, Lois; Millsteed, Jeannine (March 22, 2012). "Impact of assistive technology on family caregivers of children with physical disabilities: a systematic review". Disability and Rehabilitation: Assistive Technology. 7 (5): 345–349. doi:10.3109/17483107.2012.667194. PMID 22436000. ^ Anderson, Wayne L.; Wiener, Joshua M. (June 1, 2015). "The Impact of Assistive Technologies on Formal and Informal Home Care". The Gerontologist. 55 (3): 422–433. doi:10.1093/geront/gnt165. ISSN 0016-9013.